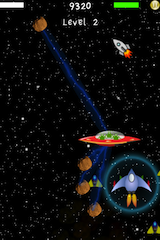 You vs Aliens is a fast paced space shooter for the iPhone. 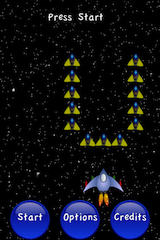 UvA offers continuous game play for non-stop action. 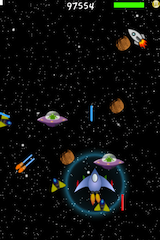 You battle the aliens to protect your home world. 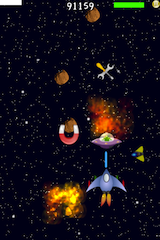 You can find many powerups to help you along the way. 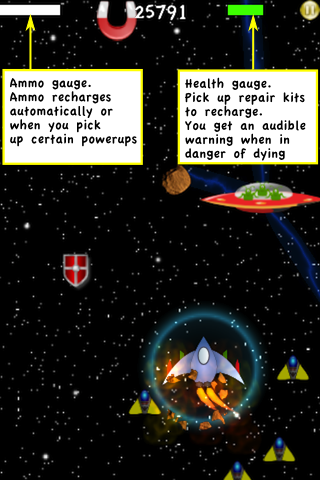 These powerups include your faithful drones that swarm to protect you. 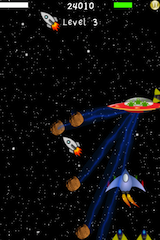 The large alien ships are equiped with tractor beams that allow them to utilize the asteroids as a weapon against you. 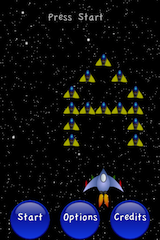 Tactically picking up the right powerups is required to defeat them. Tilt your iPhone to move the ship left and right. Touch anywhere on the screen to fire. It sometimes helps to use both hands to shoot quickly! Refills your ammunition. Not shooting too fast and picking up refills becomes more important as you progress through the game. Provides you temporary protection from everything. 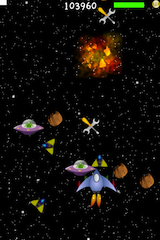 Destroy asteroids by crashing into them with impunity. Refills your health and ammunition. Critical to pick up as difficulty increases later in the game. Provides a temporary speed boost. Attracts useful powerups towards you. 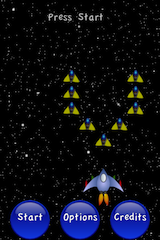 Pick it up to make it your drone that circles around your ship to protect you. It attacks certain types of enemies on your behalf.